Freemake Video Downloader downloads YouTube videos free “as-is” in MP4, WebM, 3GP, FLV formats. Download any YouTube videos as MP3 music files. Save YouTube links to AVI, MKV, WMV, iPhone, PSP, Android, phones, etc. Download several videos at once. Original quality is preserved. You can also copy the video link from the address bar. You can remove the video from queue by clicking “x” at right corner as shown below. 7-Zip is open source software. You can use 7-Zip on any computer, including a computer in a commercial organization. You don’t need to register or pay for 7-Zip. 7-Zip works in Windows 10 / 8 / 7 / Vista / XP / 2012 / 2008 / 2003 / 2000 / NT. First download and install 7 zip. The “Copy” button can be used to copy selected files/folders to a specified folder. To move files/folders, select the files/folders and click “Move“. Then select a folder in which files/folders will be moved. It also shows the folder in which the archive file will be created. To change the folder click on button as hown below. “Archive Format” lets user choose the output file format. you can choose from from “7z’, “zip”, “tar”, “wim”. Store : the files are not compressed and just archived in a archive file. The process is extremely fast. Ultra : It achieves ultimate level of compression but time taken can be many hours to complete. Dictionary Size : larger dictionary size means better compression level. Larger dictionary size requires more Free RAM memory to compress files. Recommendation : Use maximum dictionary size of 128 MB. Above it you won’t achieve any good compression level. Memory usage for compressing tells the free RAM memory size required compress the files with current settings. If you try to compress files in system with less RAM than required, then the system will hang. Ticking “Encrypt filenames” causes the file names of the files being archived to be encrypted so that no one can see the file names that has been archived. It is recommended to be used when you are password protecting a files which in confidential. password protected archive file “28-04-2016#18.zip” has been extracted to folder named “28-04-2016#18” as shown below. To extract a archive file using windows explorer context menu, select a file and right click on it. To extract multiple archived files using windows explorer context menu, select the files and right click on it. File/folder compression procedure taking place. Depending on the file size and CPU speed the archiving process will take time to complete. Enter the password the will be used to encrypt the archive file below “Enter password” under Encryption. use a strong password that cannot be easily guessed by others. The benefit of splitting files is that it can send as emails which as file size limits. Large sized file size can be split into 700 MB size to be written in CD. Large sized file can be split to fit into smaller size pendrive. You can set the file split size in “Split to volumes, bytes“. as example i have set it to 20M which is 20 megabytes. The benefit of creating self extractinf archive file is it does not need any software to extract the files in it. Self extracting archive named “Programs” created. After installing/uninstalling few application some entries gets left in the startup that is not valid. These autorun entries cause delayed bootup or other error messages during bootup. A large percentage of users must have such invalid entries after few months of usage and are recommended to delete it. But there is no automatic cleaning tool. You need to do it manually. For that, you need Comodo Cleaning Essentials. KillSwitch – an advanced system monitoring tool that allows users to identify, monitor and stop any unsafe processes that are running on their system. Malware scanner – Fully customizable scanner capable of unearthing and removing viruses, rootkits, hidden files and malicious registry keys hidden deep in your system. 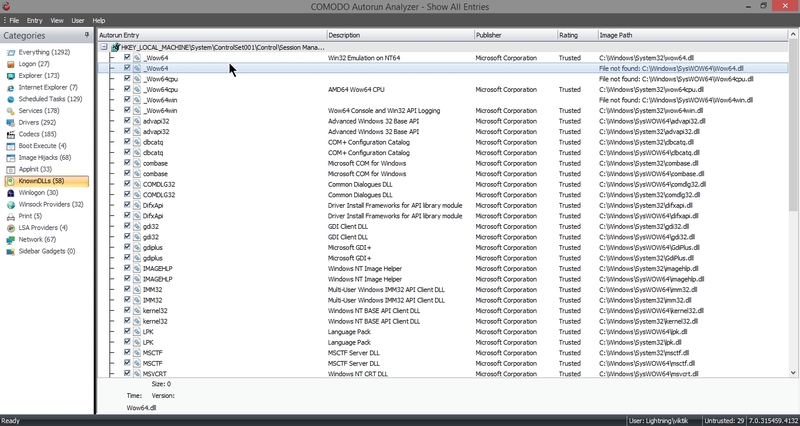 Autorun Analyzer – An advanced utility to view and handle services and programs that were loaded when your system booted up. 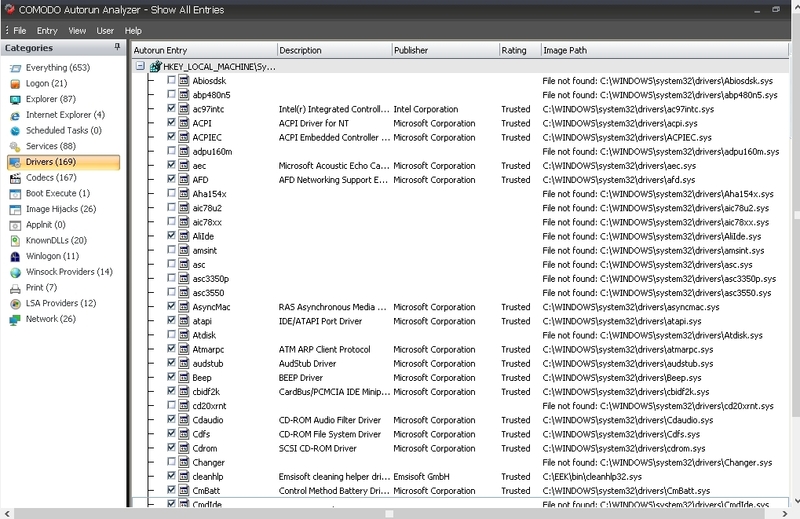 Everything – Displays all the autorun items in the main display pane. 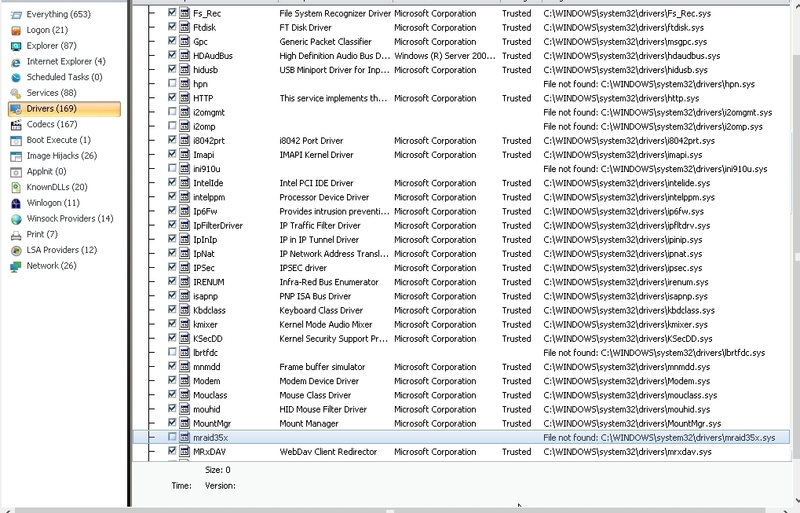 Logon – Displays only the autorun items identified from standard autostart locations such as the Startup folder for all users, the Registry Run keys, and standard application launch locations. Explorer – Displays only the Explorer shell extensions from various installed applications, browser helper objects (BHO), explorer toolbars, active setup executions and shell execute hooks. Internet Explorer – Displays only the BHOs, Internet Explorer toolbars and extensions. Scheduled Tasks – Displays the modules loaded by tasks and applications scheduled from Windows Task Scheduler. Services – Displays the modules loaded as Windows Services. Drivers – Displays only the kernel-mode drivers that are in currently enabled on the system. Codecs – Displays the autorun items loaded by various coders-decoders used for handling media files like audio and video files. Boot Execute – Displays the autorun items loaded by applications, services, and commands executed during the time period between the system boot-up and the user log-on. Image Hijacks – Displays the modules loaded by image file execution options of various applications installed in your system. Most of the malware modify the image file execution options of a legitimate application and make themselves to run when the real application is started. Autorun Analyzer enables you to identify such illegitimate autorun items loaded by malware that affect the image file execution options of legitimate applications and to disable/remove them. AppInit – Displays the application initialization Dynamic Link Library (DLL) modules loaded as autorun items. KnownDLLS – Displays the DLL modules loaded by Windows for the start-up applications that reference those DLLs. Winlogon – Displays the DLL modules registered for Winlogon notification of logon events. Winsock Providers – Displays the DLL modules registered for Winsock protocols, including Winsock service providers. An anti-malware software does not scan Winsock Service Providers as it is treated as a safe zone. Taking advantage of this, some malware enters into your system as a Winsock Service Provider. But Autorun Analyzer can identify the DLL modules loaded by Winsock Service Providers and notify you if they are untrusted. It also enables you to remove those untrusted modules from your system. Print – Displays the DLLs load into the print spoolers configured as services to start with Windows. Some malware finds their entry through Print spooling service to start themselves automatically during system start-up. LSA Providers – Displays the DLL modules registered by Local Security Authority (LSA) authentication, notification and security packages. Network – Displays the DLL modules loaded by network connection services. Throughout I am asking to delete the entry, but you can also just untick it to disable the entry. After reboot, if you get successful reboot you can delete those entries. In explorer shell extension entry, you can see Baidu entry with no Image path. Since the file does not exist in the system the entry associated with must be deleted. below you can see one entry which has “image path” but there is no description or publisher. you should look online for it. Here is driver entry file “Image path” is valid but there is no description. If you look online it’s safe. So don’t need to delete it. again file not found in the hard disk. So delete it. here there are two entries. Files exist in the system and are safe. here is codecs entry. three entries are there with no file in hard disk. here again “File not found” so delete it. here in LSA provider. Entry size is zero.